NERF is a popular brand in our house. From the Fire Vision footballs to the NERF squirt guns, we have many NERF branded today. When this brand offers a new toy for the house, our family is usually first in line. 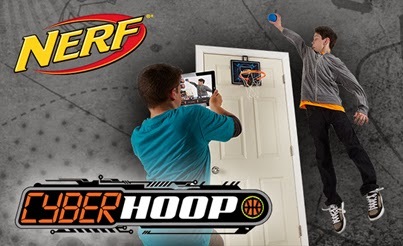 The NERF Cyber Hoop takes the classic NERF basketball game to new levels. Since many kids are constantly on their smartphones, this NERF game brings together technology and NERF excitement. Kids plan their most awesome dunks, tricks and moves. With the iOS free app, kids can record their best moves forever. Now everyone will know your awesome moves are the real deal. I would recommend an open space or playroom for this game. Even with the NERF basketball, the kids should have a large area to play this game. I would recommend the back of a playroom door. Also, remind the kids not to pull, hang or try to yank down on the hoop. We had to fix ours a couple of times because the kids were a little too rough. The NERF Cyber Shot does not require using the app. IT can be used as a stand alone game. If your kids do record video, please use your best judgment on where and how to upload them. With the long, cold winters that might be rolling in, the NERF Cyber Hopp is a great way for the kids to be active while inside. NERF Cyber Hoop is sold at many mass merchants and online. Disclosure: I am a BzzAgent. I received this item to review. All opinions are my own. Wow my kids would totally love this!